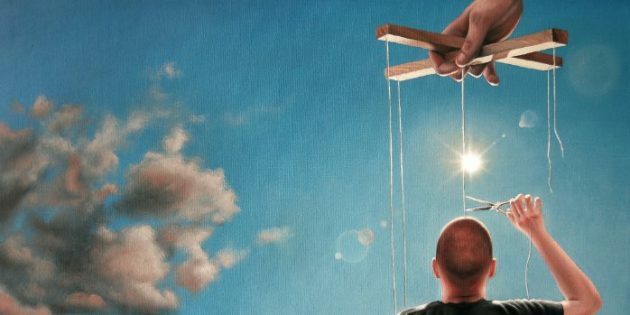 Politicians are all just puppets for true power that prefers to govern from the shadows and remain anonymous for security purposes. We all know this. So who's controlling the strings Donald Trump and Hillary Clinton? So whether you were planning on voting for Hillary or Donald his election cycle, don't bother. You're in essence voting for a bought and sold puppet with strings leading back to Eastern European roots; thus neither is an authentic American agenda at heart. It's all more of the same. In fact, it can now be seen that Donald has been ordered to take a dive for Hillary, which keeps the Clinton/Rockefeller/Rothschild Dynasty in power; and thus Donald is malevolently serving his Dark Nobility family with a defeat both in politics and in terms of reputation--which will be made up to him amply through other real estate investments we're certain. This is how American politics ​really works, and has always worked since the​ days of George Washington (who ran essentially unopposed) during the first US Presidential Election​,​​ circa 1788–89​. The Dark Nobility always figures out a way to covertly place two seemingly opposed candidates within a binary election structure, so that they never lose control of the top decision making seat. ​Doesn't matter what country, they always attempt to position their people in top leadership position to control the masses anyway they desire. What's happening now is their binary structure of control has been thrown out of all democracies via the Paris Agreement, and even their puppet dictators are having to step aside. Here in the USA, all three branches of government: White House (Executive), Congress (Legislative) and the Supreme Court (Judicial) have been replaced quietly without public knowledge because America is ​finally ​returning to its ​pure ​Constitutional roots as a​n organic​ Republic, free of foreign control​ mechanisms and agents--which is why the first wave of English settlers came to the new world in the first place--to get away from Dark Nobility ​political ​control and ​burdening ​taxation. The long awaited Acquarian Age is upon us, and it is rolling out effortlessly. It's arrival is nothing short of miraculous and monumental. As one human race of living, soul-filled beings, our collective rate of ascension will be stunning. Technological advances will come so quickly, so constantly, so easily that it'll make all heads spin and legs jump for joy. So by all means, cut all your strings to the past, and adopt fresh, new ways of thinking so that your former enslavers accept they can no longer keep you ignorant, indifferent and terrified a moment more. Remember, change is not their specialty after 13 millennia of control, thus in your ability to "change your mind" lies your freedom. Watch as the Dark Nobility surrenders to possibility, surrenders to hope, surrender to love, surrenders to the Will of God--the same God they rebelled against when arriving on this planet. Because no more are there vibrational limitations holding back humanity now… we children of the light, are truly free and united as one.